Try Selita Ebanks’ neutral palette to work with white pumps by pairing a sleek dress with trench coat or khaki blazer. 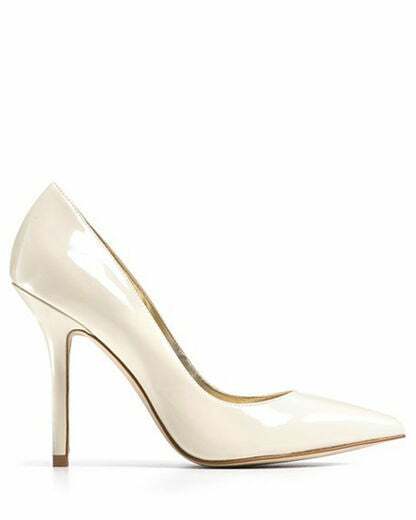 “Mipolia” patent leather pump, Guess, $99, bloomingdales.com. “Kaden” suede pumps, Charles Jourdan, $225, endless.com. Cross strap court shoe, ASOS, $140, asos.com. Cassie’s look is so summer chic! Her simplistic white, single-strap sandals pop in a sea of color giving her leopard jumpsuit an even bolder touch. “Scooter” perforated leather platform, Topshop, $156, topshop.com. Cross strap platform, Sole Society, $50, solesociety.com. “Midori” leather and wood wedge, L.A.M.B., $210, piperlime.com. Take cues from Kelly Rowland and work a stark white style with a fabulous contrast colored gown for a party. Ankle strap sandal, Sergio Rossi, $920, stylebop.com. Pair them with a pretty palette like LaLa Anthony’s coral colored frock for a softer touch on a date night. “Danica” woven heels, Alexander Wang, $595, ssense.com. Ankle strap sandal, Zara, $100, zara.com. Leather biker sandals, Barbara Bui, $1,105, ssense.com. “Tobago” wedge sandal, Audrey Brooke, $75, dsw.com.